The Docking station for iphone is 100% Brand New and High Quality because the cell phone home phone dock is carefully crafted for a superior design. This best docking station has premium components in which each detail of the cell phone handset dock is created to ensure functionality. This lightning connector dock is not only functional, this desk charging station also raises the bar with a designer pattern to make the apple iphone dock station durable and great for home or office use. The Iphone dock and holder is very easy to use, just insert cable in the mobile phone holder and place your device on the dock to use. The Docking station usb is compatible with lightning 8 Pin USB cable or wall charger (both not included in this listing). 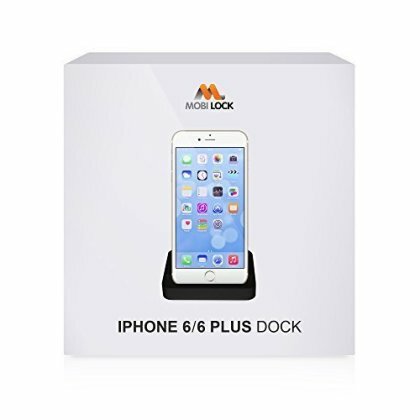 Mobi Lock's dock iphone 6s makes it more simple and convenient to view emails while charging on dock. This cell phone home docking station and mobile holder keeps your smartphone and apple device organized on your desktop or counter. Mobi Lock's lightning dock can make your life convenient because this charging dock synchs and charges your phone, while this dock iphone has fast charging feature which means Iphone lightning dock delivers full speed charging. This smartphone dock has a premium design which is highly versatile, this cell phone mount has steady aluminum alloy for it to stand on flat surfaces and the Cell phone desk holder and dock station has high quality PVC Copper wire and premium circuitry. The docking station for phones serves as an ideal replacement for the original Apple dock because this iphone dock is great quality at a good price. The phone holder and dock station is compatible with iPhone 6, 6S, 6 Plus, 6S Plus. This cell dock is good for keeping your dock iphones on your desk in the office or home, the USB docking cradle holds your iPhone at a comfortable reading angle and this desktop docking station allows you to conduct speakerphone calls with your iPhone in its dock. This cell phone dock and iphone 6S Plus charging dock has a no-clutter and space-saving design which makes the usb docking station easy to keep. The phone mount has 3/4 inch anti-sliding silicone padded slots to increase the mobile charging stand features, the apple iphone 6S dock has weighted, non-slip base to keep it on your bedside table without fear of knocking your Apple phones over when turning off the alarm or answer a call. Finally, iphone dock station makes a good gift for everyone.